Patients today are healthiest when there’s a team approach involved. That means that we, as the periodontal specialists, will stay involved with your treatment once you’ve been diagnosed with periodontal problems. But we in no way feel it’s best for us to take the place of your dentist. You still are at risk for dental disease and your dentist is best to examine you and guide you in this fashion. The amount of information we gather to make sure you are healthy, and have the best chance of avoiding future treatment, takes about 15 minutes per cleaning. This is something we’re very good at and our track record for our patients is clearly beneficial to you, our patient. The dentists we work with tend to be really happy we do this for you and that we send them the information we gather. Once your periodontal treatment is completed, we will recommend that you alternate your cleanings between your dentist and us. This gives you the best of both worlds. 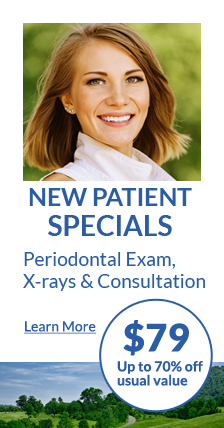 The things your dentist will examine you for and guide you for are essential, and your dentist will be very happy that we’ve done the periodic assessment to give you the best chance of never having to be treated for your periodontal problem again.